Holly Orlando and William Hill. Photos by The Book LLC. North Salem, New York – Holly Orlando won every class in the Green Conformation Hunter Division aboard catch ride, William Hill, to earn the Grand Hunter Championship at the Old Salem Farm Spring Horse Shows, running through May 22 at Old Salem Farm in North Salem, NY. Highlighting jumper action on the Grand Prix Field on Wednesday, Paul O’Shea (IRL) and Skara Glen’s Presence won the $10,000 Open Jumper 1.40m. Orlando, who hails from Wellington, FL, had not sat on William Hill before Monday, but got the ride for his owners, the Hymowitz Family of Rose Hill Farm. The six-year-old Warmblood gelding is regularly piloted by Scott Stewart in the Green Conformation division, as well as owner Lilli Hymowitz in the Small Junior Hunter division. After only one school earlier in the week, Orlando kicked off the division by winning the model and under saddle on Tuesday before earning the top spot in all four classes over fences, including Wednesday’s handy round. Stewart imported William Hill during the summer of 2014 before the Hymowitz Family purchased him in Florida this February under the direction of trainer Jane Ehrhart. After leaving Old Salem Farm, Ehrhart plans for William Hill to head to Devon and then focus on qualifying for indoors this fall with both Scott and Lilli in the irons. Patricia Griffith and Fetching, owned by Lexi Maounis, were reserve champions in the Green Conformation division. They picked up second place finishes behind Orlando in every class. Wednesday’s hunter competition wrapped the divisions counting towards the $5,000 Leading Hunter Rider Award, which was presented to Louise Serio after her consistent performances throughout the Old Salem Farm Spring Horse Shows. This week alone, she collected 13 blue ribbons, all contributing to the 235 points that crowned her leading rider. Paul O’Shea (IRL) had not taken the opportunity to test the speed of Skara Glen’s Presence before Wednesday’s 1.40m, but the stallion was quick to prove he has what it takes to win in the jumper ring. O’Shea and the eight-year-old Holsteiner he owns with Skara Glen bested 49 horses in the immediate jump-off class over courses by Alan Wade (IRL). O’Shea has plans for Skara Glen’s Presence to be a top contender for ribbons at the grand prix level and is off to a great start. While Skara Glen’s Presence’s big stride gave O’Shea a significant advantage, they were also fast, stopping the clock double clear in 35.999 seconds. Leslie Howard (USA) and Gentille van Spieveld, owned by GJ Stables & Peter Howard, claimed second in 37.441 seconds, while Jeffery Welles (USA) and Calais took third in 37.441 seconds for owners Sharon Gunthel and Triton Ventures. Lauren Tisbo (USA) was fourth in the irons of Coriandolo di Ribano for Tequestrian Farms, LLC in 38.896 seconds, and Maggie McAlary (USA) capped the top five for Double H Farm aboard HH Ciske van Overis with a time of 40.376 seconds. 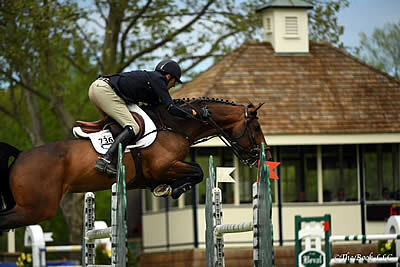 O’Shea, who is based out of Whipstick Farm in South Salem, NY, brought Skara Glen’s Presence to the Old Salem Farm Spring Horse Shows to gain valuable experience on the grass Grand Prix Field. But, this venue also serves as an anniversary of sorts for O’Shea and Skara Glen’s Presence. The stallion first caught O’Shea’s eye as a six-year-old while competing at the American Gold Cup with previous owner, Derek Braun. The Old Salem Farm Spring Horse Shows continue through Sunday, May 22, highlighted by the $130,000 Empire State CSI 3* Grand Prix, presented by The Kincade Group, $10,000 USHJA International Hunter Derby, presented by The Gochman Family, the $15,000 Under 25 Grand Prix, presented by T & R Development, and the $35,000 Speed Derby of North Salem, presented by TownVibe. Thursday’s competition will see a $10,000 Open Jumper 1.45m and $5,000 Under 25 Jump 1.45m for jumpers, and the crowning of Grand Adult Amateur Hunter Champion.